Nelle Stinnett Decker, age 89 of Hardinsburg, KY died Saturday, August 25, 2018 at Signature Health Care Hillcrest in Owensboro, KY. She was born in Hardinsburg, KY on August 6, 1929, the daughter of the late Hubert and Bettie Lee Claycomb Stinnett. 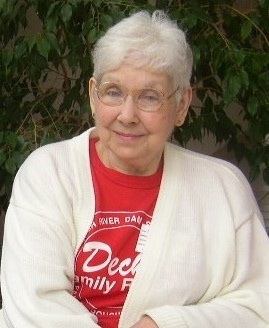 Nelle was a retired Administrative Assistant at Fort Knox. She was a member of Goshen Baptist Church and when able was very involved with church activities. She loved her family and time spent with them. In addition to her parents, she was preceded in death by her husband Bill Decker, her grandson John Douglas Decker, brother Hubert Stinnett, Jr. and sisters Emma Sandefur and Carrie Placek. Funeral services will be held at Goshen Baptist Church on Thursday, August 30, 2018 at 12 PM with Rev. Chuck Ellis officiating. Burial will be in the Glen Dean Cemetery. Visitation will be held at Trent-Dowell Funeral Home on Wednesday, 4-8 PM and Thursday, 8 - 11:30 AM. Expressions of sympathy are suggested to Goshen Baptist Church.